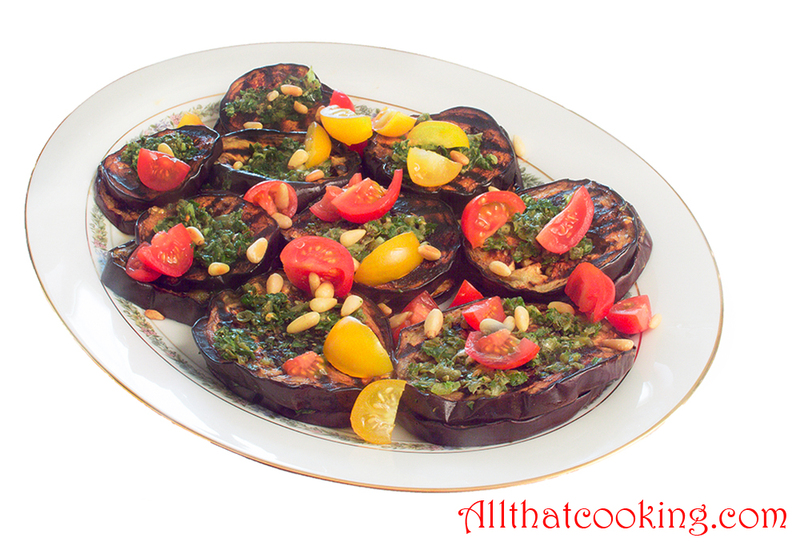 Here’s a great way to savor the early summer flavors of garden fresh eggplant, and herbs adapted from Marco Canora. Don’t have a garden? Not an issue. Head to your local farmers market (or even the supermarket), fire up the grill and cook up a batch of this summertime goodness. It’s a great appetizer, or part of an antipasto platter. You can serve this as an accompaniment to grilled chicken or meats as well. There’s no need to pre-salt the eggplant to remove moisture, nor do you have to peel it. Dry grilling the slices helps to maintain their shape and keeps them from getting mushy. The result is a lovely succulent, meaty texture. Cheers! Here’s to a happy summer! You can make this a day ahead. Cover and refrigerate overnight. Bring to room temperature before using. 1. 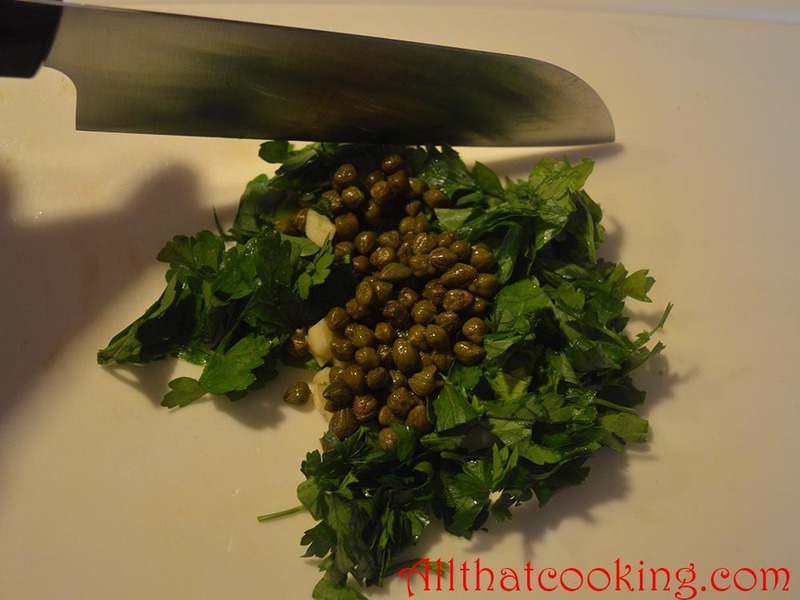 Place parsley, garlic and capers on a cutting board and roughly chop. 2. Add oregano and peperoncini. Chop until everything is well combined. 3. Move mixture to a medium size bowl. Slowly add oil and stir until mixture is moistened and holds together. Pesto should be moist, not swimming in oil. 4. Salt and pepper to taste. Reserve. This dish was part of the menu for Oli’s going away party and that day it was easier to grill in the kitchen. Heirloom cherry tomatoes are colorful, sweet and divine. You can sweeten them up a bit more by tossing them on the grill if you want. It’s a good idea to get organized before you start to grill. Pour some balsamic into a shallow bowl and place next to the grill. 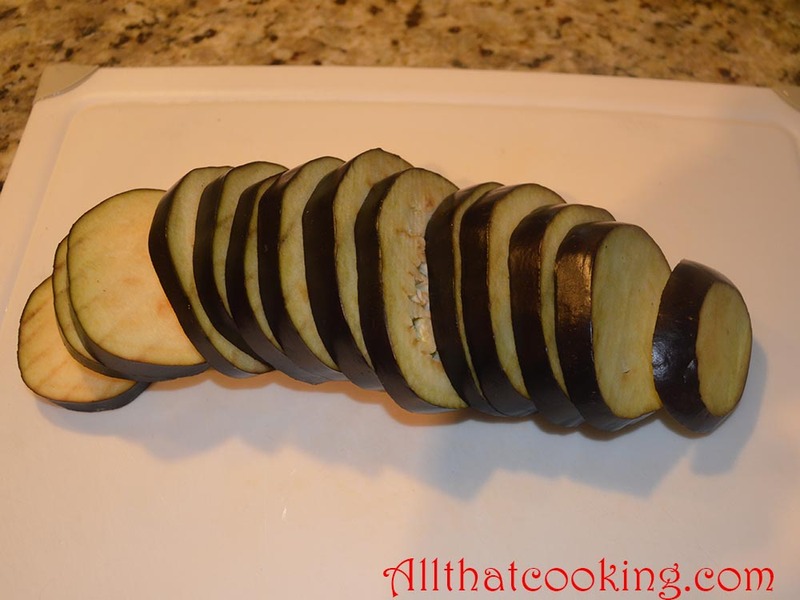 Place a serving platter or large plate next to this, so that you can take the eggplant from the grill, dip them into the balsamic then place them on the serving platter. 1. Heat outdoor grill or grill pan until extremely hot. 2. 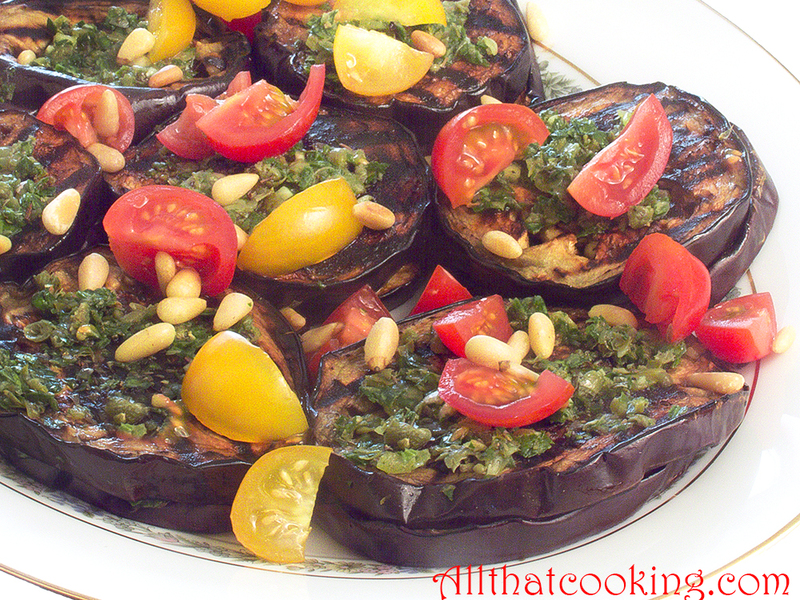 Place eggplant slices on grill or in grill pan. Cook about 4-5 minutes, until well-marked. Turn slices over and cook until tender. Blacken these babies to get the full flavor. 3. As you remove each slice from the grill, dip it into the balsamic and place on serving platter. Spread each slice with about a teaspoon of the pesto. 4. 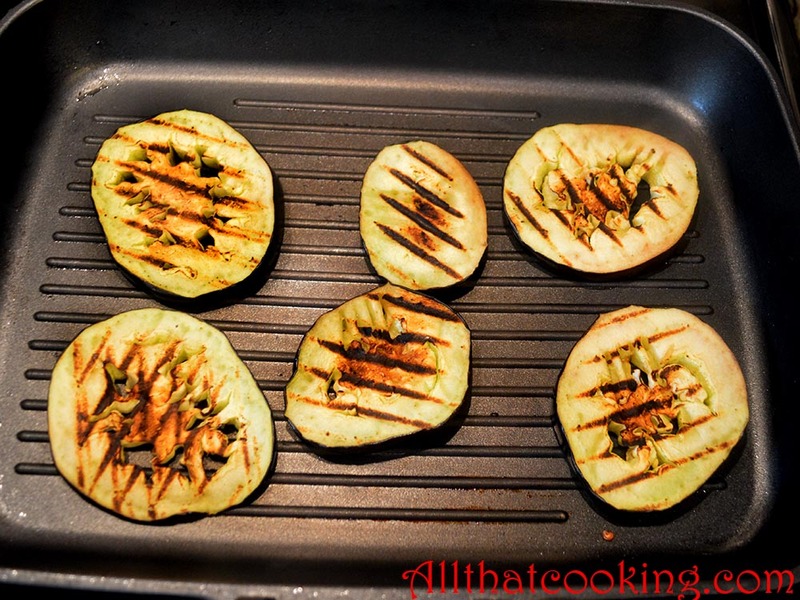 As you continue to grill, and dip place newly grilled slices over the ones on the serving platter. Top these with pesto as well. 5. Cover and marinate at room temperature about 2 hours before serving. You can refrigerate for several hours as well. Bring to room temperature before serving. When ready to serve, strew toasted pine nuts and heirloom tomatoes over top of platter. 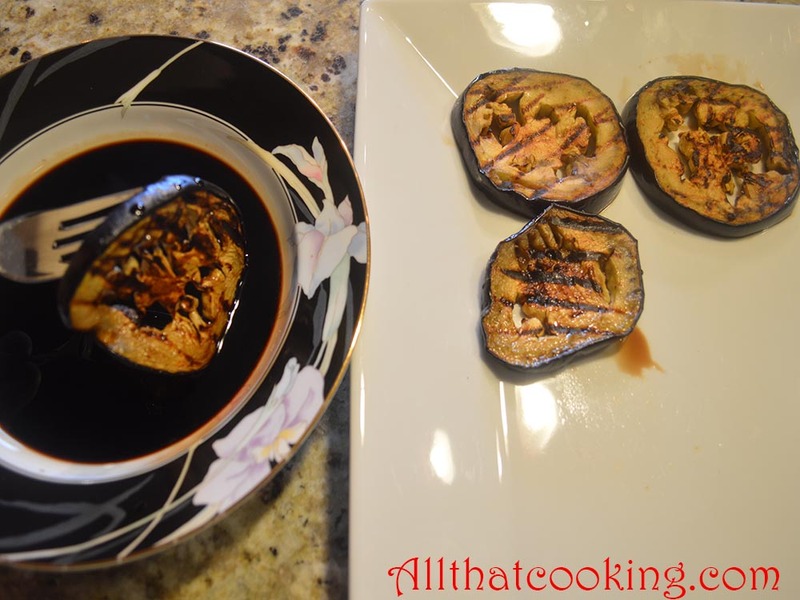 Gallery | This entry was posted in Antipasto, Appetizers, Grilling, Sides and tagged antipasto, aubergine, balsamic marinated aubergine, eggplant, grilled aubergine, grilled balsamic eggplant, grilled marinated eggplant, parsley pesto, pignoli, pine nuts. Bookmark the permalink. I bring some spelt bread over for the dinner! Pesto is my favourite sauce and spread. Gina I love pesto. My basil is not enough yet to make it so I bought some at the store. I cant wait to make this! Thanks a ton for this outstandingly delicious recipe. Thanks for the comment Gabi. One of my friends always requests that I bring this dish whenever I have dinner with her and her parents. I like that fact that the eggplant is dry roasted. So healthy and easy.